GOP strategist Noelle Nikpour told MSNBC’s Stephanie Ruhle on Thursday morning that President Donald Trump is increasingly angering women by supporting Supreme Court nominee Brett Kavanaugh while rubbing his support directly in their faces. Nikpour quickly compared Trump to an arsonist. “It’s like there’s flames and flames, and ‘here’s a fire, I’m going to pour gasoline on it.’ Leave the subject alone,” she said. Nikpour also warns that the GOP is going to face an uphill battle with women voters and the general public because of Trump’s public actions. 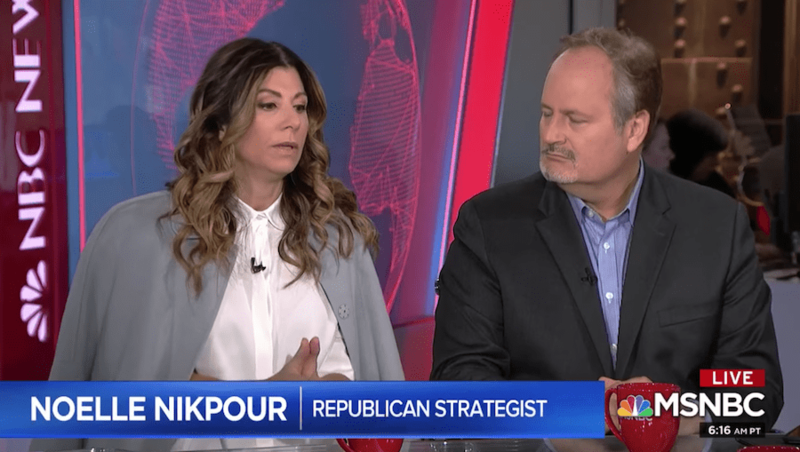 When Ruhle asked Nikpour, “has the president’s abusive behavior been a positive?” Nikpour gave a firm answer as she spoke out against the party she has long supported. “I really think this is so sensitive in so many different ways,” she said. “You’ve got a Supreme Court, which is one of the most highest, most respected positions at risk. You have the women’s movement. You have the Me Too movement. You have women voters. You have the midterms. You have a lot of dynamics,” Nikpour added. Nikpour also said Trump should go back to his original position of simply allowing Congress to do its job without Presidential involvement.